Patricia Codere at Fraser Yachts in Fort Lauderdale is now offering the 27.03m raised pilothouse motor yacht Aurora Dignitatis for charter in the Caribbean this winter and the Western Mediterranean next summer. Built by Ferretti in 2008, she sleeps nine guests in four staterooms, each with private bath, plus a day head on the main deck. The master suite features a king berth, the VIP cabin has a queen berth, there is another queen guest cabin and one twin cabin with a Pullman berth. Aurora Dignitatis has been fitted with new engines, two 2,211hp MTUs that easily meet all expectations, pushing the top speed to 29 knots with a cruising speed of 26 knots. Upgraded electronics and audio/visual equipment, a custom interior design package and an Atlas Power Converter for worldwide cruising are some of the many options and upgrades on this vessel. There's a special introductory rate of $38,000 per week in the Caribbean this winter and €50,000 per week in the Mediterranean for summer 2012. 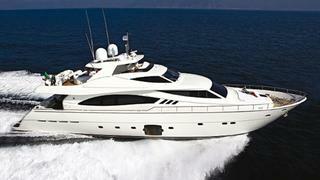 Aurora Dignitatis is also listed for sale by Fraser Yachts asking $5.8 million.